2.7 million blog posts are published every day (Hosting Facts). That’s a lot of blogging. But what makes blogging so popular? Blogging is a great way to attract potential prospects to your business, and connect with them in a deeper way through your content. By creating valuable content that is relevant to their needs, you build authority and trust with your audience, which sets a strong foundation for a loyal customer base (Hubspot). As more and more people around the world have access to digital technology, the opportunity to take the size and scope of your blog readership to a whole new (and global) level has never been greater. But, do you know how to reach them? If you want your blog posts to be found, read and appreciated by people across the world, then read on. In this article, you’ll learn how to create how to create a blog post that attracts a global audience. I’ll walk you through the steps you need to cover and techniques you can implement right away. Before you start creating any content for your next post, conduct an audit of the blogging landscape in your niche. Use data to guide your content creation from the outset (Convince and Convert). How can you identify top performing posts? On Buzzsumo you can type in your topic area then filter for the most shared posts by language or by country. This means that you can identify the most popular content in your most important markets internationally. Use Buzzsumo to find out what content performs best in your niche. Take the time to look at the comments and social media shares for the most popular posts, and consider who is engaging with the content. Are they the same audience that you are trying to attract? If so, how can you refine your content focus to align with their needs? Check the comments section for content ideas: what questions are they asking? What challenges are they facing? Could you write a post that addresses these needs? Just because you are trying to attract a global audience does not mean that you are trying to attract every single person in the world. Rather, you are trying to reach that specific segment interested in your topic, wherever they might be located globally. For example, you may want to attract the global community of long distance runners, Labrador lovers, or Star Wars fanatics. Once you have identified your ideal reader, you need to take time to understand them and what they are looking for so that you can create content targeted towards their specific needs. Let’s consider how to do that now. Create a buyer persona. This will help you pinpoint your ideal audience, empowering you to write a blog post that speaks directly to them. Of course, your blog may contain a variety of articles designed to attract different buyer personas. But you need to identify the specific persona this blog post will serve as this will feed into the content you produce. Pinpoint the specific question or need that your blog post will address, ensuring this is commonly faced by people in your niche at a global level and not just in your local area. Investigate whether your topic has global relevance by following the data-driven approach outlined above. If it does not, how can you adapt it to make it more applicable at a global level? You might need to change topic altogether, or merely tweak it by replacing local with global outlook, content and examples. Consider the level of knowledge your target audience has of the topic area. Are you trying to attract beginners to the area or those with more advanced knowledge? What questions do they need answering? Beginner topics may focus on defining what something is or how to get started, whilst more advanced topics may focus on optimization or mastering knowledge in a specific area (Copyblogger). Once you have identified a suitable focus for your post that will resonate with people across the world, you need to get their attention with a compelling headline. The headline plays a crucial role in attracting readers to your post. On average, 8 out of 10 people will read headline copy, but only 2 out of 10 will read the rest (Copyblogger). So, get your headline wrong and no one will even get to discover your content, however good it might be. Your headline needs to motivate your reader to read the rest of the post. To do that, your headline needs to make a compelling promise that is relevant to your target audience. This might be promising a solution to their problem or providing valuable information (Tips and Tricks). The trick is to identify a smart hook. To uncover it, visualize your reader and ask: what is keeping them awake at night? What do they want to achieve, or need to learn? How will your blog post help them reach this end? Once you have identified it, craft a headline that is specific and clear on how reading the post will benefit them (e.g. enable them to save time, earn more money, etc.). To attract a global audience your headline also needs to be captivating to all your readers and not just those in your home market. So, when selecting a headline, consider what questions and problems are faced by your audience across different countries. You’ve enticed your reader with a compelling headline. You now need to deliver on that promise, whether it be providing guidance or solving a specific problem. How can you do this? You need to deliver quality content that offers an original perspective and is relevant to your target audience. Let’s consider these aspects in turn. Focus on quality over quantity in your content generation. But you also need to select a suitable length for your post; one that is attuned to your audience’s time and appropriate to the complexity of the issue that you are addressing. The length of your post should ultimately be determined by the space needed to answer the question. Offer a unique perspective. Don’t repeat what has already been said. Maybe your chosen topic has already been covered; that’s ok, especially if a lot of people are commenting on and sharing the content. In fact, it’s very good as it shows the subject is engaging the market. The trick is to carve your own distinctive angle on a popular topic in your niche. By adding your own unique voice or personal experiences you can shine new light on a well-trodden topic. You also need to ensure your blog post answers the question in such a way that the content is valuable and applicable across international borders. How can you ensure global relevance? Once published, assess performance of your post. Use data to assess whether, and to what degree, your blog post is connecting with your intended audience (Convince and Convert). Is it attracting a global audience? Are they sharing the content on social media and going on to read your other posts? If the answer is ‘yes’, continue to build upon your success by creating more related content for your blog. If not, consider why. If you are not driving traffic to the post, check that your headline is truly appealing to the target audience. If your post is attracting a high number of views, but engagement is low, verify that the style is appropriate, and that the content is relevant and useful for your target audience. 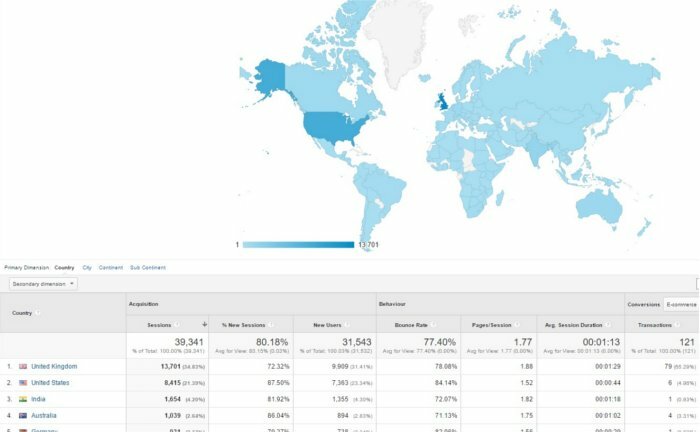 Use Google Analytics to assess how your content is performing across different world regions. “The global economy is hungry for content, trust, and value” (Copyblogger). Maintaining a consistent blog enables you to build an audience, earn their trust, learn what they most want, then sell that to them. 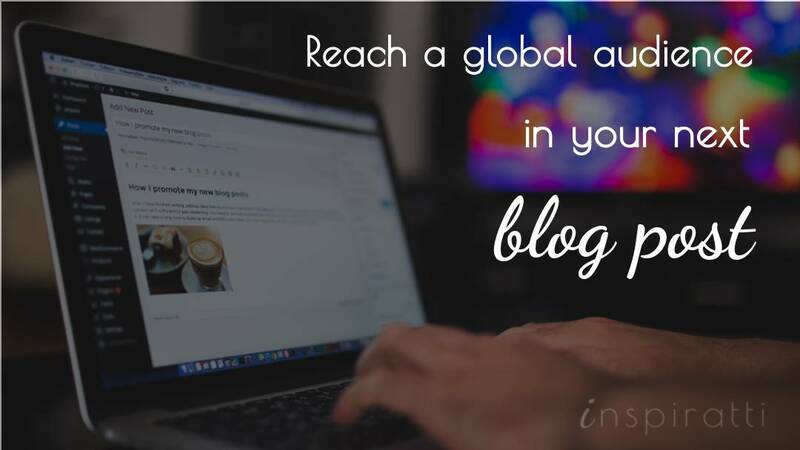 Building up a global audience for your blog is an ambitious task. But the fact is that whilst perceptions and behaviors vary across countries, the basic rules stay the same. The success of your blog hinges on building up a library of quality posts that are engaging and interesting to your target audience. So, if you are operating in an area that has relevance to a global audience, it’s time to stop focusing so much energy on your home market and think about positioning it for a global audience. Are you writing your blog posts for an international audience? How do you make your blog posts accessible to people located around the world? Share your experiences in the comments.